A perfect match of star and show, Evita benefits mightily from the powerhouse vocals and intense presence of Tina Arena. The fact that Evita has not been seen in a professional production locally for 30 years has given this return season added allure (I was left home with a babysitter the last time Evita played Melbourne nearly 40 years ago). 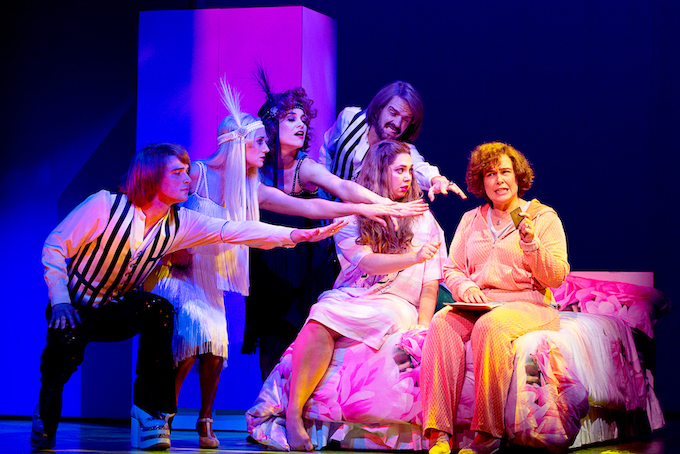 Arguably Andrew Lloyd Webber’s very best score, the through-sung drama is a veritable hit parade of hummable tunes. Act two boasts an extraordinary number of melodies, with precious little of the endless regurgitation of music that mires much of Lloyd Webber’s later work. 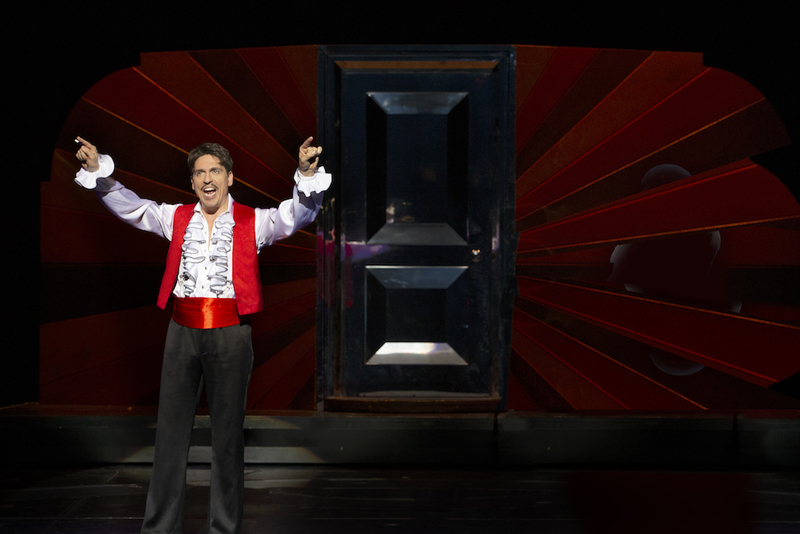 A return to the original staging to mark the show’s 40th anniversary, the production is a window into the time when concept shows were in vogue over book musicals. Company, Follies and Cabaret are other examples, all directed, as is Evita, by legendary Broadway artist Harold Prince. There is a timeliness to Evita’s warning of the perils of dictatorships, but the show may not necessarily be the right fit for a theatre where recent seasons have been glorious revivals of Golden Age Broadway musicals such as South Pacific, The King and I and, the crowning achievement, My Fair Lady. Even the presence of a generously sized orchestra of 29 musicians does not have the quite same impact as these other recent revivals, much as Guy Simpson’s musical direction is reliably marvellous; the nature of the music just does not lend itself to a lush orchestral sound. 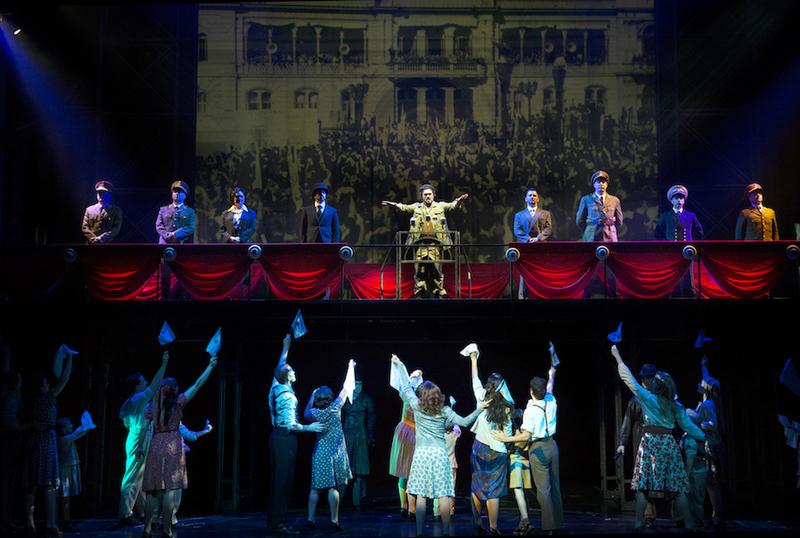 Loosely chronicling the rise and untimely death of Argentinian first lady Eva Peron, this version of Evita gives little or no respite from Eva’s searing ambition nor from the tragic inevitability of her deteriorating health. Without book scenes to advance the story, pertinent action happens visually within songs, such as when militial thugs beat and remove opposers during Eva’s public appearances. There is a sense of The Emperor’s New Clothes to the sparse staging, credited to original designer Timothy O’Brien. Above a black box stage, a large, mobile screen shows enough footage of the Perons and their people to fill a documentary. Small pieces of scenery occasionally come and go (quite clunkily), and most costumes favour realism over theatricality. Eva scores the best of the costumes, which are cleverly used to tell her story. In “Goodnight and Thank You,” the increasing glamour of Eva’s nightgowns reflects her brisk trajectory of her financial and social status. This song also sees Eva’s hair change from brown to bottle blonde. Another clever use of costume is when the wealthy elite are stripped of their apparel, merging inconspicuously with the descamisados they have previously feared. 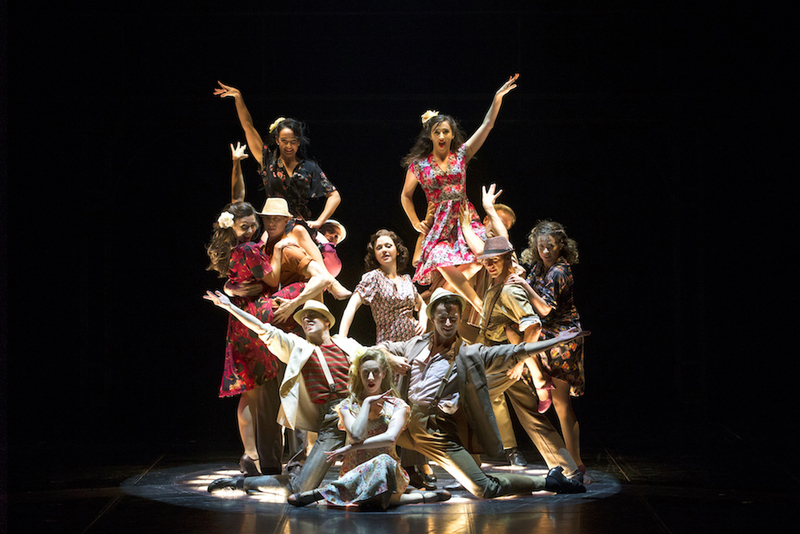 Segments where the show comes alive are enthralling, a prime example being act one finale “A New Argentina.” Ruling from their bedroom, the number begins with Evan and Peron and gradually builds to a thrilling company number, the stage filled with bold protest placards, banners and even fiery torches. The orchestra is at a premium in this number, and it is another song to benefit from pristine harmonies from the ensemble. Scenes that are particularly undercooked include Magaldi’s nightclub performance of “On This Night of A Thousand Stars” and act two’s camp classic “Rainbow High.” In the absence of scenery, much of the action happens in something of a vacuum, a situation not helped by Richard Winkler’s dark lighting design in which lead actors are mostly picked out by spotlights (apologies to the chorus members). I am all for respecting adult audience intelligence, but I am also a fan of the modern capabilities of stage design. 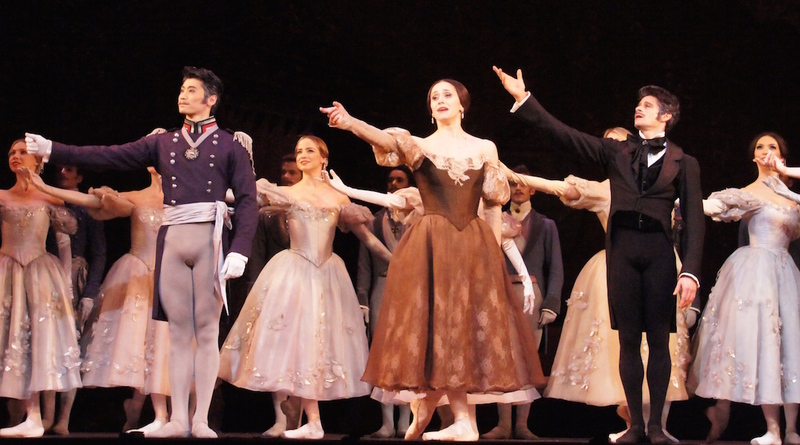 An entertaining and well realised creative aspect of the production is the sensational choreography of Larry Fuller. When shown in full lighting, the ensemble can be seen to be performing with crisp precision and rousing gusto. Such a star is Arena that her fame upstages her own first entrance, when Eva is meant to come forward from the anonymous throng of mourners. Beginning with gentle vocals as the young Eva, Arena builds up through “Buenos Aires” and really lets loose in “A New Argentina.” Rounding out a two-show day straight after the official opening night, Arena showed not the slightest hint of vocal tiredness, producing a glorious sound at all registers and volumes. A good physical match for revolutionary Che Guevara, Kurt Kansley maintains a focused presence in the everyman/narrator role and his singing is strong and clear. An aspect that is missing at this point, however, is the spark of chemistry between Che and Eva. Without a taunting sparkle in the eye of Che, there is an overall lack of tension in the show. When Che and Eva eventually come together (fictionally) in “Waltz for Eva and Che” it should be absolutely electric, but at the moment there is not even a spark. A high quality stage partner for Arena, world-renowned Brazilian baritone Paulo Szot makes his Australian musical theatre debut on the stage where his Tony Award-winning role of Emil de Becque (South Pacific) was played by a local star back in 2012. Physically imposing, especially next to Arena, Szot captures the smoothly handsome, inert smugness of Colonel Peron. When permitted to sing, such as in “She is a Diamond,” Szot’s rich baritone sounds wonderfully appealing. 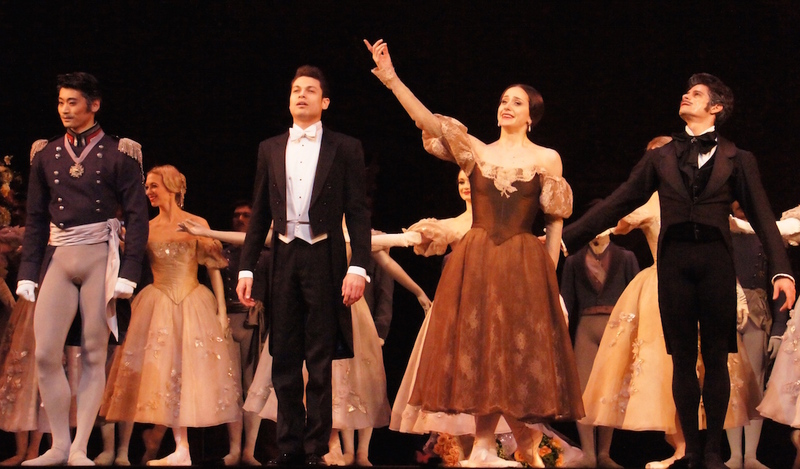 Young discovery Alexis van Maanen makes an extremely auspicious main stage debut as Peron’s Mistress, who is routinely dismissed by the fiercely ambitious Eva. Gifted with the solid gold classic “Another Suitcase in Another Hall,” van Maanen deftly underplays the scene to excellent effect, all the while singing with the voice of an angel. Michael Falzon brings a vibrant spark to Magaldi, although there is a sense that his talents are under-utilised in the rather thankless, underwritten role. 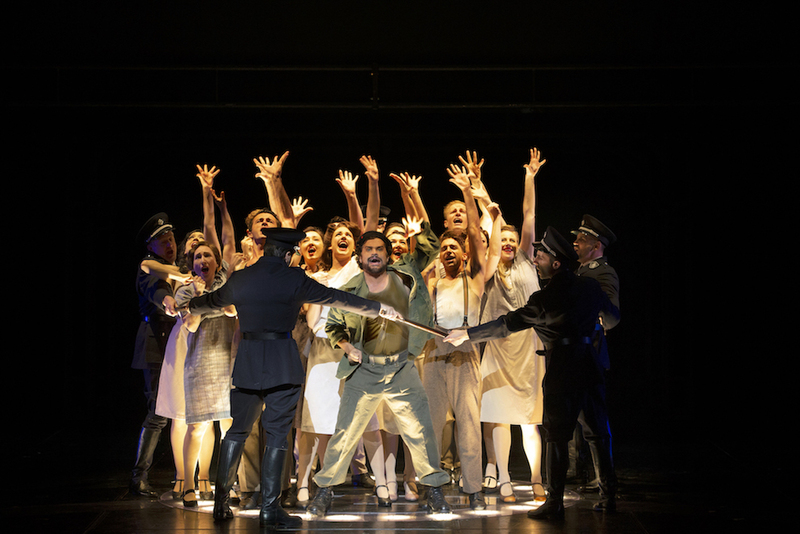 Evita is an iconic musical, and the current production is a welcome chance to see the show, especially with such a great star in the title role. 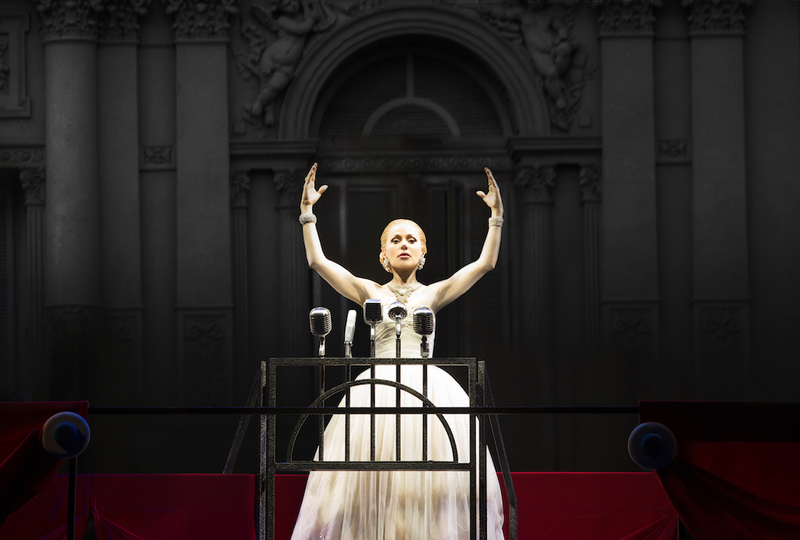 Evita plays at Joan Sutherland Theatre, Sydney Opera House until 3 November 2018. Evita plays at State Theatre, Melbourne 5 December – 10 March 2018. I always approach any production of Evita with caution as it is never a given that all elements will be ok on the night. With its scaled back production values the casting is paramount. 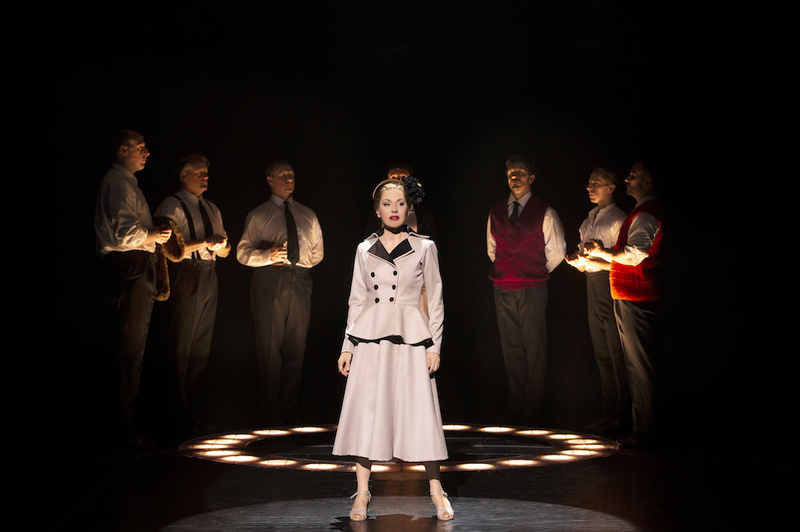 Unlike some other shows Evita is dependent on strong, in-synch principals with incredible vocal stamina. I still think they are searching for a definitive, professional interpretation of this show as there are elements that remain dramatically unresolved. Amateur productions of Evita have worked better for me as one is able to almost invade the characters’ personal space and breathe with them. I have chosen to see Gemma Rix as Evita in Melbourne when maybe some of the wrinkles have been ironed out and casting is more harmonious. Ever elusive – a great description. Even the movie, with all its resources did not live up to my hopes. You are are also right about amateur productions – my most memorable Evita was a production I saw by university students. I felt the sound design lacked punch and though the big ticket moments did bring the orchestra section up, we still wanted for more….it is a “rock opera” after all. Tina vocally radiant and not pushed or strained sounded lovely. Other voices were great too. Did the cast engage us ? I felt somewhat disconnected and such was the discussion at interval among people I attended with and some others sitting nearby. Che n Peron did have amazing voices but lacked in delivering on dramatic front. I’ve seen Evita productions in America and at a performing arts camp in New York– and this production was not as good for me. We could not understand the words to the songs– terrible sound/ acoustics/ annunciation– the show felt rushed and emotionless. The storyline did not come through. There were basically no sets/ scenery throughout the show with the exception of a screen and a catwalk being used here and there. Thought Tina Arena’s vocals were great, and the song by Alexis Van Maanen was a show stopper. Most importantly though, my family agreed that we could not understand the words to most of the songs, so that was either a sound production fail, and/ or a lot of poor annunciation. I am very intrigued to hear how Evita will sound in the State Theatre. Seen evita last night, the actors where all great, I was disappointed in the poor staging it was very plain and simple for the price you pay I expected better costumes, more colour. Otherwise Tina and all cast where good performers .